Purnima Mane, Ph. D, M. 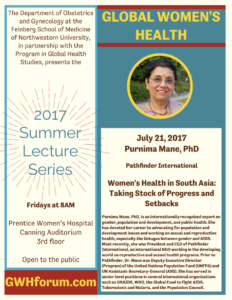 Phil., M.A., is an internationally recognized expert on women’s health, gender, population and development, and public health. She has devoted her career to advocating for population and development issues and working on sexual and reproductive health, especially the linkages between gender and AIDS. Most recently, she was President and CEO of Pathfinder International, an international NGO working in the developing world on reproductive and sexual health programs. Prior to Pathfinder, Dr. Mane was Deputy Executive Director (Program) of the United Nations Population Fund (UNFPA) and UN Assistant-Secretary-General (ASG). She has served in senior level positions in several international organizations such as UNAIDS, WHO, the Global Fund to Fight AIDS, Tuberculosis and Malaria, and the Population Council. 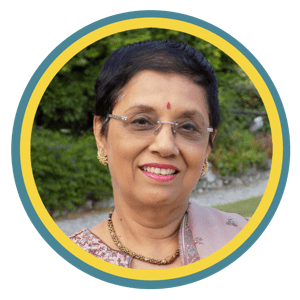 Before launching into an international career, she worked for over a decade and a half in India on public health and gender-related issues, while serving as Associate Professor at the Tata Institute of Social Sciences, Mumbai. Dr. Mane holds a doctoral degree from the Tata Institute of Social Sciences in Mumbai, India in women’s studies. She has co-authored several papers and co- edited a number of books, and is a founding editor of the journal, Culture, Health and Sexuality. Mane is Board member of the International AIDS Vaccine Initiative and the MTV Staying Alive Foundation and Visiting Professorial Fellow at the Centre for Social Research in Health at the University of New South Wales, Sydney, Australia.